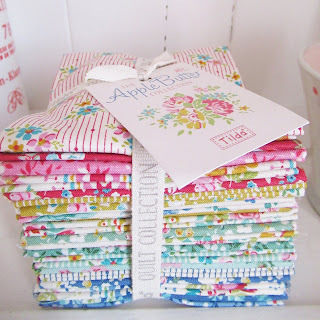 Your flowers, fabric, and precious little hearts have me thinking of spring! I always enjoy my visits, Helen. Have fun making your new quilt! I just returned home from one of my knitting/crochet groups, such fun times with great ladies; and I had to catch up on your latest blog post. 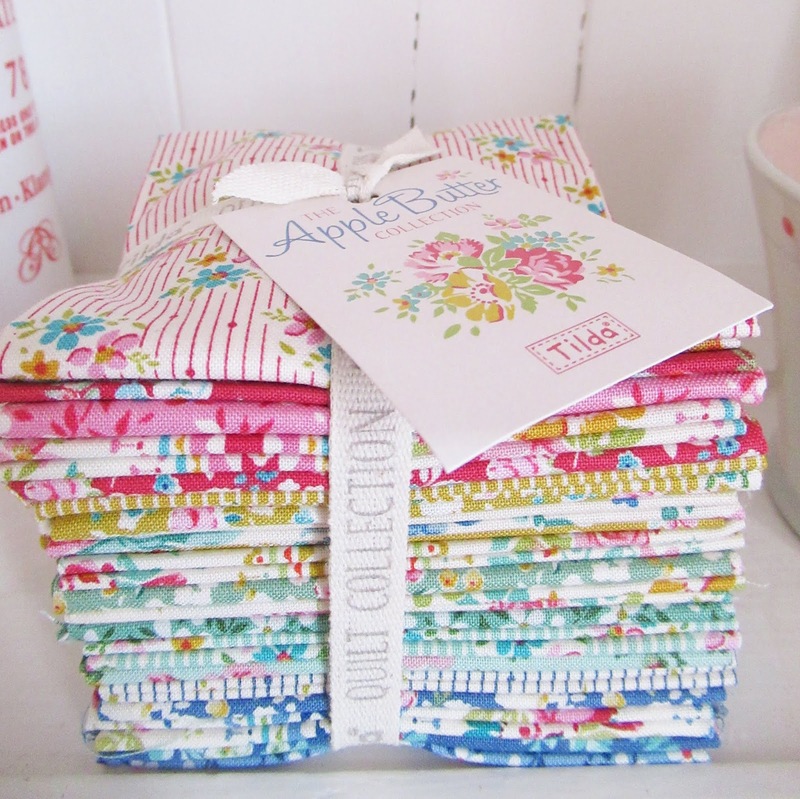 I love, love, love the Tilda Apple Butter fabrics, and they are perfect for your sweet little hearts. Using them in a quilt would be just the ticket too. I completely understand the "cutting into it" thing. I have several precuts that I have been admiring for quite a while. Your dainty cherry blossom wreath reminded me to take down my winter wreath and hang my pink and white tulip wreath on our front door. Maybe it will encourage spring to get here sooner, do you think? Your sewing room looks so inviting. My sewing room needs a lot of tender loving care and tidying up. I have expanded into our spare bedroom. Yikes! I need to get serious about de-stashing. Is that a real word? 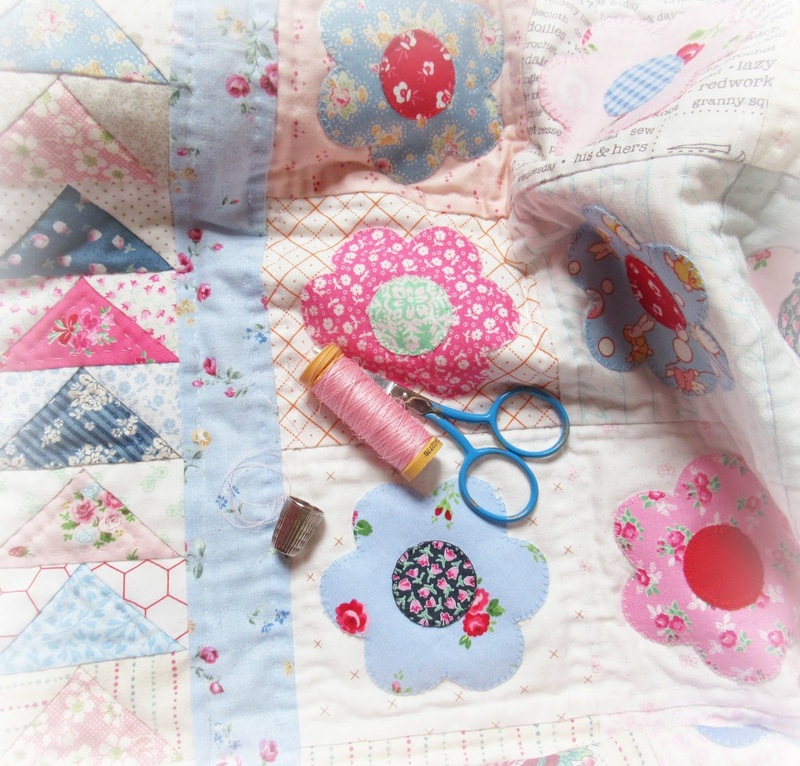 I am looking forward to seeing your flower and flying geese quilt when it is finished. Thank you for sharing your talented crafty world. Lots of lovely Valentine images Helen!! 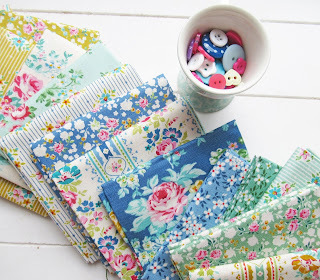 Your new fabric is so pretty, it will make a beautiful quilt!! Yes, it definitely felt like spring today and I believe it's going to get milder as the week goes by which is wonderful. Another beautiful post Helen , I love all the soft colours around your house , the flowers I just love the pretty hearts and quilt all so pretty. 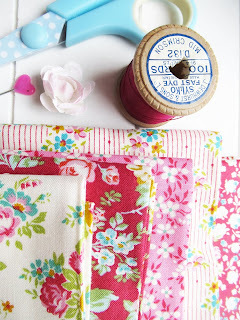 The sewing machine took me back in time when I use to make all my daughters dresses , it was the best machine I ever had , I wish I still had it now. I love your blog it's my start of the week go to. The colours are wonderful, especially this time of the year. I think your hearts are so sweet. Thank you for sharing Helen. Fiori, cuori, fantasie di stoffe, sempre belle le tue foto e la tua casa così colorata. Such lovely fabrics and cute projects, Helen! Love your bouquet of tulips to brighten the room with - and the day :)! I'm still enjoying the twinkling lights on my Christmas tree - as our days are blustery and wintery - this covers the window nicely, and makes it all cozy inside :)! 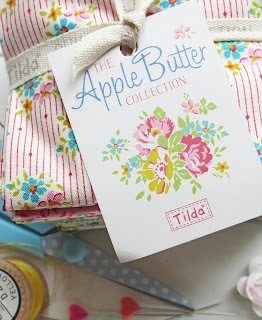 Tilda fabrics are so pretty, but a bit difficult to find here. Your photos are full of pretty things that hint at spring and at Valentine's Day. Have a lovely week. You always work with the nicest fabrics, Helen. The heart is beautiful.